Judith’s Reading Room has supported two institutions for at-risk youth: Harkins House in Hillsboro, Oregon, and Children’s Home of Easton in Easton, Pennsylvania. Each institution received a custom library and implemented monthly Book Clubs. With the help of our partner organizations and Dr. Christian Tatu, professor at Lafayette College, we conducted impact assessment research to understand the impact of a book club on teens who have not succeeded in school. According to the U.S. Department of Education, 85% of juvenile offenders have reading problems. Compounded by violent learned behavior, these youth are disempowered through a vicious cycle of poverty, crime, and violence. The Book Club effort fights to change the perspective of at-risk youth, who feel as though they cannot turn their lives around because of the previous choices they’ve made. Newberry Award-winning author Jerry Spinelli spoke to Children’s Home of Easton Book Club members and Judith’s Reading Room Board of Directors before a performance of his book Stargirl. 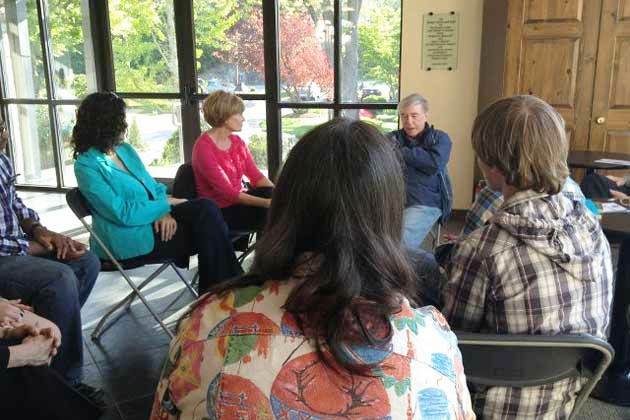 Award-winning author Jerry Spinelli met with Children’s Home of Easton Book Club members.